Image: (L-R) Parliamentarians Hon. Nigel Dharamlall, M.P., Hon. Gail Teixeira, M.P., of the People’s Progressive Party (PPP), Managing Director of SASOD Guyana, Mr Joel Simpson and Hon. Dr Nicolette Henry, M.P, Minister of Education (Guyana). In December 2018, Guyana’s Society against Sexual Orientation Discrimination (SASOD) celebrated its 15th anniversary with a cocktail reception at the Impeccable Banquet Hall in Georgetown, Guyana. For over 15 years, SASOD Guyana has been a dedicated voice for the LGBTQ+ Guyanese and has promoted non-discrimination and equality in the country and the Caribbean region. The Hon. Dr Nicolette Henry, M.P, Minister of Education, delivered special remarks on behalf of the Government of Guyana. Minister Henry spoke about SASOD’s notable achievements on local, regional, and international stages such as engaging local government, leading public education and sensitization on gender and sexual diversity, and providing essential services to Guyana’s most marginalized citizens. Minister Henry also commended SASOD for the recent victory at the Caribbean Court of Justice where the organization played a critical role in demolishing a colonial-era law that criminalized cross-dressing and disproportionately penalized transgender and gender non-conforming persons. She said that this landmark decision highlights the fact that outdated laws do not reflect the current realities and values of inclusion and cohesion in Guyana today. The Minister confirmed the Government’s commitment to ending all forms of discrimination and fulfilling the promise of equality and a good life for all Guyanese. Founder and Managing Director, Joel Simpson, spoke on behalf of SASOD Guyana. Simpson spoke fondly of the humble beginnings of the grassroots movement as a student-led lobby group, and proudly of the acclaimed, influential movement, it has become. “SASOD Guyana has represented the LGBTQ+ community for the past 15 years and has used every opportunity possible to hold the state accountable for its human rights obligations. SASOD will continue to advocate for equality and inclusion of all persons in Guyana”, stated the Managing Director. Also in attendance were Opposition Chief Whip, Hon. Gail Teixeira, M.P., and Hon. Nigel Dharamlall, M.P., of the People’s Progressive Party (PPP). 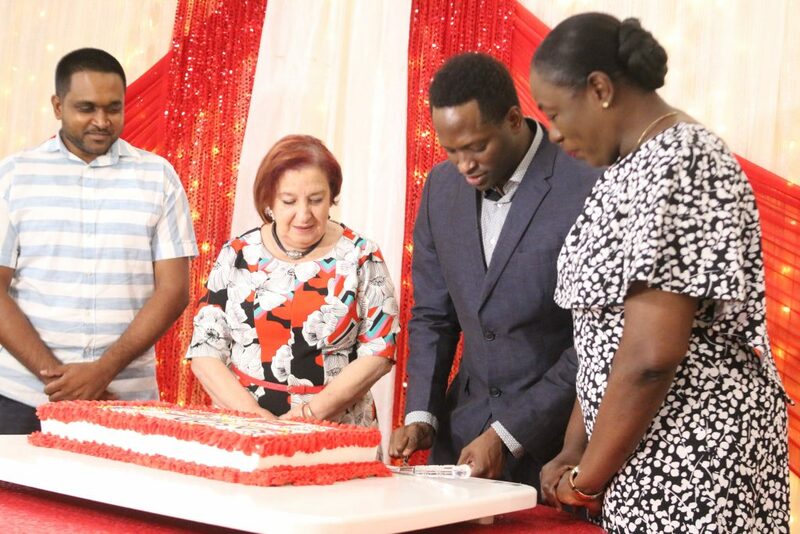 The two PPP parliamentarians joined the Education Minister and Simpson in cutting the SASOD 15th Anniversary cake. The celebratory event was supported by the United Nations Development Programme (UNDP) and COC Netherlands, a Dutch organization that supports LGBT people. CARICOM Secretariat, Turkeyen, Georgetown, Guyana. This website is made possible by the support of the American People through the President’s Emergency Plan for AIDS Relief (PEPFAR) and the U.S. Agency for International Development (USAID) under the Knowledge for Health (K4Health) Project (AID-OAA-A-13-00068). The contents of this website do not necessarily reflect the views of the U.S. Government, PEPFAR, USAID, or K4Health.